Romelu Lukaku thinks left-back Luke Shaw has been Manchester United's best player this season after enjoying an immense resurgence at the club. His future at the club appeared to be bleak due to persistent criticism from former manager Jose Mourinho, but Shaw's form improved at the start of the season under the Portuguese coach. That secured him a regular place in the team, an England recall and a new contract at United, suggesting the potential which long seemed to be slipping away has been rediscovered. 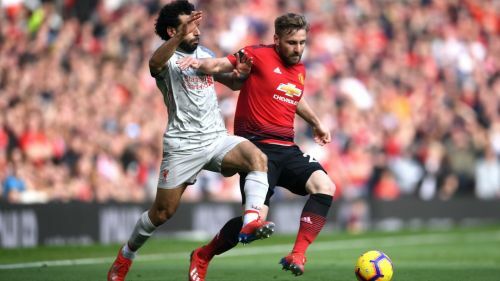 Shaw was then a standout performer for a depleted United in Sunday's 0-0 draw at home to Premier League leaders Liverpool, dealing admirably with the threat of Mohamed Salah on his flank. Although Lukaku believes United's defence in general has been excellent in recent weeks, he reserved special praise for Shaw. "Everybody is talking about us being offensively really good, but defensively we are doing really well," Lukaku told reporters. "Chris Smalling coming in the last couple of games [after injury] has been brilliant, and Luke Shaw has been the best player of the season for me. "Ashley Young has been consistent and David de Gea is the best goalkeeper in the world." Dropping points against Liverpool allowed Arsenal to move back up to fourth at the expense of United, and Ole Gunnar Solskjaer's men now find themselves in something of an injury crisis. Marcus Rashford, Juan Mata, Ander Herrera, Nemanja Matic and Jesse Lingard are all expected to miss Wednesday's trip to Crystal Palace through injuries picked up over the weekend, and Lukaku has urged his team-mates to not dwell on the negative aspect of such a situation. "We have a number of injuries, but we have to stay positive - have that positive mentality," the Belgium international said. "We are Manchester United and you have to go wherever and win. You just have to adapt. "It is about being mentally strong when you have players injured. Roy Hodgson will set up his Palace team really well, so we will prepare and we need to recover properly because Liverpool was a physical game, but we will be ready to go again."